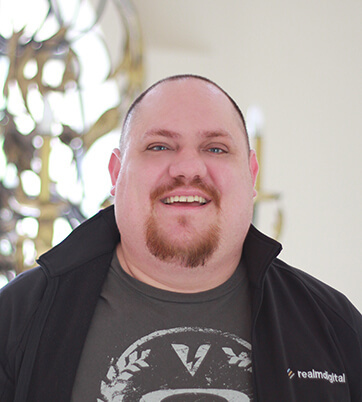 Johannes Zacharias Du Bruyn known as Zachie, has recently joined the Realm team as Senior Developer. Zachie was born in the Free State, raised in Mpumalanga. He has been living in Cape Town for the past 14 years and is definitely not looking back. As Senior PHP Developer, he will be Team Lead on various projects and be responsible for software development across various platforms for Clients within the Realm portfolio. Zachie has been hooked to the IT industry ever since he wrote his very first “hello world” program in 1996. He is mostly self-taught in the industry where he has completed over 60 certifications through various online platforms. The part he loves the most about Software development is definitely the contribution it has to finding solutions to make business easier, faster and simpler. On new technology that excites him, the most has to be Cloud Technology, and in particular serverless solutions. Outside of the office, Zachie likes going out for wine tastings and building Lego. “I have a huge lego collection and I am a proud AFOL (google it).” Something even more interesting about Zachie is that he studied Theology and has even performed the wedding ceremony of his sister and her husband. Welcome Zachie, great to have you on board.